The EBT731 Balometer features an innovative detachable micro manometer that may be used in conjunction with optional test probes to greatly increase your flexibility on multiple measurement job applications. 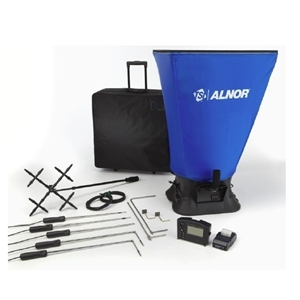 The lightweight Alnor EBT731 offers problem free operation, durability and is ergonomically designed to save you time and money with the combination of multiple measurement test tools into one convenient package. TSI's EBT731 Balometer Capture Hood enables you to create energy efficient and healthy indoor air quality environments while simultaneously complying with local regulations, guidelines and codes for HVAC ventilation systems.